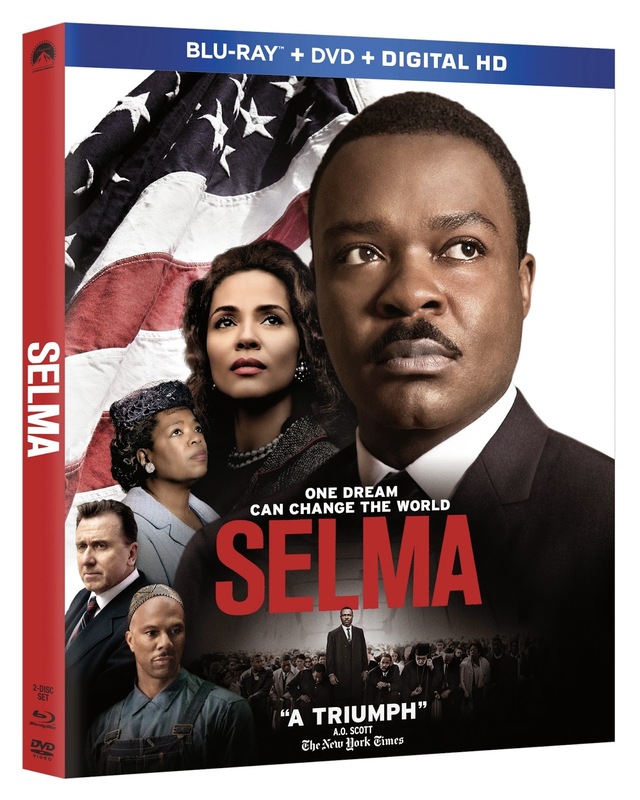 Paramount Home Entertainment recently released information for the upcoming DVD and Blu-Ray combo pack release of "Selma". The film was nominated for an Academy Award® for Best Picture and won the Oscar® for Best Original Song for John Legend and Common’s compelling tribute “Glory. "Selma" stars David Oyelowo, Academy Award nominee Oprah Winfrey, Academy Award nominee Tom Wilkinson, Academy Award winner Cuba Gooding, Jr., Academy Award nominee Tim Roth, Grammy®-winning artist Common, Giovanni Ribisi, Carmen Ejogo, and Lorraine Toussaint. Special features on DVD and Blu-Ray include National Voting Rights Museum and Institute and Selma Student Tickets: Donor Appreciation. The Blu-Ray will feature more extras including Commentary by director Ava DuVernay and actor David Oyelowo, Commentary by director Ava DuVernay, director of photography Bradford Young and editor Spencer Averick, The Road to Selma, Recreating Selma, “Glory” Music Video featuring John Legend and Common, Historical Newsreels, Photo Gallery and Deleted and Extended Scenes. "Selma" hits retail on May 5th. Hailed as “extraordinary” (David Denby, The New Yorker), “deeply moving” (Claudia Puig, USA Today) and “a triumph” (A.O. Scott, New York Times), director Ava DuVernay’s powerful drama SELMA debuts on Blu-ray Combo Pack, DVD and On Demand May 5, 2015 from Paramount Home Media Distribution. The film arrives two weeks early on Digital HD April 21, 2015. Director Ava DuVernay delivers the “definitive depiction of the 1960s American civil rights movement” (Lou Lumenick, New York Post) with the incredible story of how Dr. Martin Luther King Jr. led the epic march from Selma to Montgomery to secure equal voting rights in an event that forever altered history. 2015 marks the 50th anniversary of the legendary march. David Oyelowo is “mesmerizing” (Kenneth Turan, Los Angeles Times) as Dr. King and leads an outstanding ensemble cast including Academy Award nominee Oprah Winfrey1, Academy Award nominee Tom Wilkinson2, Academy Award winner Cuba Gooding, Jr.3, Academy Award nominee Tim Roth4, Grammy®-winning artist Common5, Giovanni Ribisi, Carmen Ejogo, and Lorraine Toussaint. SELMA will be available in a Blu-ray Combo Pack with UltraViolet™ that includes an in-depth exploration of the making of the film, historical newsreels, a video for the Academy Award-winning song “Glory,” featuring John Legend and Common, commentary by director Ava DuVernay and actor David Oyelowo, a photo gallery and more.